First of all, you must confirm you are above the age of 18 as to enter the site and agree that you wish to view the explicit content. You do this by clicking the ‘ENTER’ button as to receive the Home page. 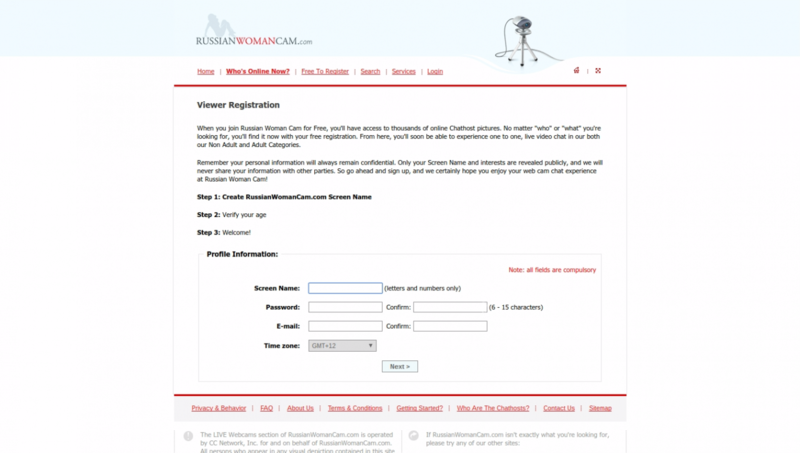 RussianWomanCam.com is a place to meet a variety of women from Russia. The design of the page is clean and does not display in the same layout as many other cam sites seem to use, with the online models and their shows as icons across the page. Instead you have a very clean and feminine look with options clearly displayed in the center. There are no annoying ads or distractions, which leaves a nicer effect. At the bottom of the page there are some examples face shots of some of the women who are available from the site. Clicking on any of the above options, (or anywhere on the home page for that matter), will take you to the next page where you will be able to browse the ladies that are online. By clicking ‘Services’ on the menu bar across the top of the page, you will be taken to a page that explains all the different benefits that you will receive from the site. 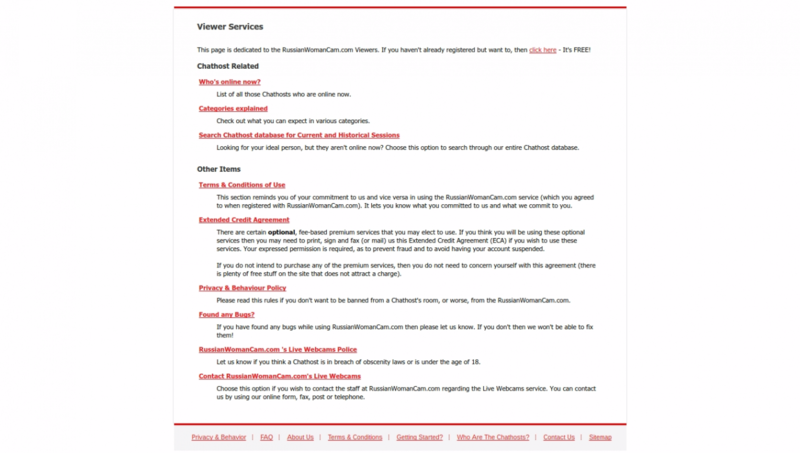 Also on this page are lists of the full Terms and Conditions involved with this particular web page. If you wish to get down to it right away, you can go ahead and select the option to ‘SEE WHO'S ONLINE’! You will then be taken to a page set out like a list, where you can scroll down to view the selection of women that are available. Each woman has a username and star rating as well as a short description and the language that they speak. You may choose your preferred option as to how to view this screen by changing the layout, the options are at the top right hand side of the list. Also, above this, is a drop down category list that you can modify to ensure that you view exactly what you are looking for in models! Here is a more in depth look at the available options of models and what they are looking for, from the viewers of the site. Some of the models are looking only to make friends, whereas others are looking for marriage! Then you have ‘GIRLS HOME ALONE’ and some may be ‘SHY’ or some may be into ‘INSTANT ACTION’. 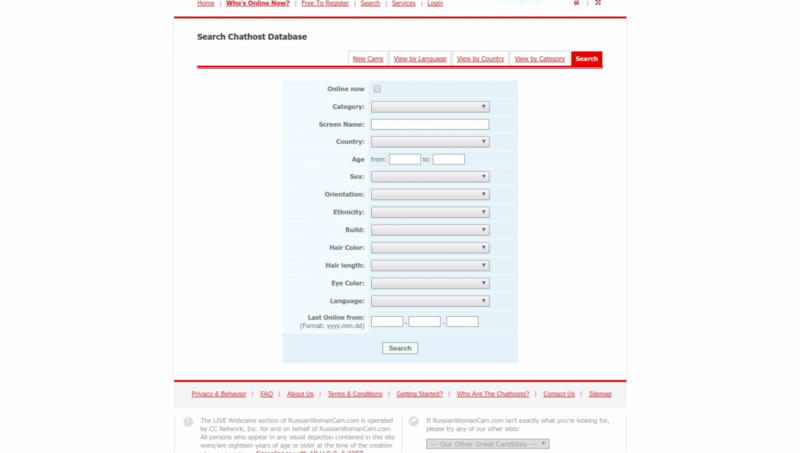 There is also a more specific page dedicated to a more advanced filter, so if you would like to be precise as to what you are looking for in a woman then you can select the ‘Search’ option across the options at the top of the screen. Here, you may pick the ‘Hair Color’, ‘Eye Color’ and even be as specific as choosing from ‘Last Online’. When you find a model that grabs your attention, you can click to enter their page and view their profile. On the profile page you will see the models likes and dislike and get a feel for what she is into. You may choose to add this model to your favorites list (if you are a member) and there is also the option to mail her. If you like what you read you may click on the link underneath the picture to enter their live show. A lot of features will require you to be a registered member before you have access and so it is a good idea to sign up. To register, first you must create a ‘Screen name’ and also a ‘Password’. Then, you will be required to provide a valid email address and your ‘Time Zone’. 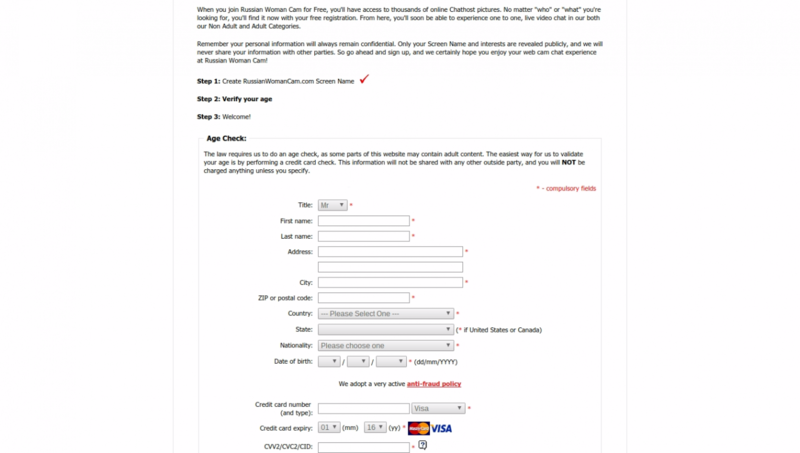 The following page asks for many more details as the site is very serious about age verification. That means that the site thoroughly ensures that every member who views the content is an adult and is also a serious member of the site. Although it is free to register, the details you are required to supply include your credit card details and so you must have this to hand as well as your address. Anyone who does not supply the correct information cannot become a member and so will be restricted from enjoying the site. This particular site is very precise and the women are mature. RussianWomanCam.com is more than just casual fun and the makers of the site are aiming for an audience who are serious about meeting their models. If you are not willing to provide the relevant information you may wish to explore different options as you will not be able to experience the full potential of this site.